Russia’s Defense Ministry has shown interest in the new electomechanical rifle the performance of which exceeds that of sniper weapons. The rifle was invented by a schoolboy in the city of Ufa. 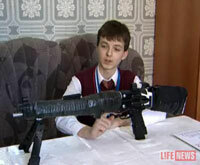 Maxim Kotelnikov, an eighth-grader, designed his weapon after he had seen a TV program about the use of similar rifles in the USA and Korea. It took the boy a year to design the new weapon. He used his friend’s broken game rifle as the basis. The rifle weighs nearly six kilos; it fires special cartridges that need to be magnetized in advance. Russia’s Defense Ministry showed interest in the new weapon and asked the boy’s permission to test his rifle. “This weapon is unique for it fires noiselessly. There is no shock of discharge and a shot does not produce a flare. No other sniper rifle can do it. I designed my own system, which I called the “Nucleus System,” the boy said. The rifle is based on the principle of accelerating coil. The rifle is powered with electricity only. A bullet gathers speed immediately, PolitOnline reports with referecne to Life.ru. Maxim showed his creation to his teacher of physics. The teacher sent the wunderkind to St. Petersburg, where the boy took part in “Russia’s Young Intellectuals” forum. The 15-year-old boy took the first place at the forum and received a special invitation for practice at the defense ministry. All further tests of Maxim’s weapon will be conducted under the guidance of ministerial scientists. The boy will assemble three other rifles in St. Petersburg during one month. If the tests are successful, it is not ruled out that the electromagnetic sniper rifle will be launched into serial production for the needs of the Russian armed forces.